Research underway as part of a local history project is unearthing lots of interesting material on Croan House and its relationship with the 'Big Houses' in the area over the last 250 years. We'll continue to update this page as we learn more - it's very very interesting work! We believe that the earliest parts of Croan House date from before 1743 when the house was extended and the facade was added by the Shirley family, long time residents and land owners in the area. 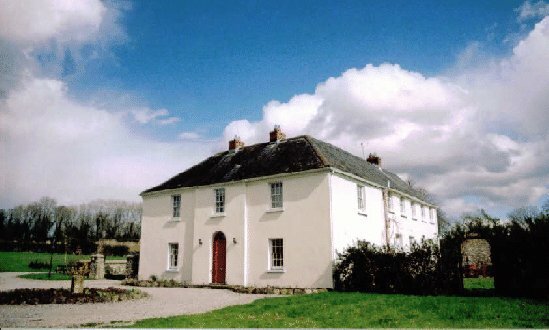 Records show that in the eighteenth century the House passed to members of the Reade family (whose origins lay in County Wexford but who had taken possession through marriage of Rossenarra House nearby), when Naomi Reade married and then divorced John Shirley (1807). Rossenarra House is famous for having been the home of the artist Sir John Lavery and his beautiful wife Lady Lavery. Lady Lavery was to appear on the Irish banknotes until the introduction of the Euro currency. Rossenarra is also well known for it's connections with Red Rum and Richard Condon, the author of the Manchurian Candidate. In more recent decades Croan House became famously associated with its colourful and eccentric residents, Mary and Kate Reade. The impressive entrance and driveway, with a broad bank of lawn to either side and avenue of mature Lime trees, lead to a gravel forecourt to the front of the house. A Duck pond, Boules court and games area are located between the House and the cottages for our guests' enjoyment. Our smallholding describes how we are restoring the walled garden behind the house and are using the rest of our land to provide us with fruit, vegetables, eggs and meat. Croan enjoys splendid surroundings with the Castle Morres demesne just next door. The estate is now a Forest Park of almost 2,000 acres. Both conifer and native broadleaf species can be found with some specimen trees dating back to the original estate gardens. A driven pheasant shoot takes place from November to January each year. The woods are a wonderful place to walk or ride and we have prepared a guide to some of the trails for our guests. Mount Juliet Hotel and Championship Golf Course is only 6 miles from the property. The picturesque villages of Inistioge, Thomastown, Graiguenamanagh, Gowran (and its horse racing) and Kells are all close by. The beautiful Slieve Na Mon mountain is about a half hour's drive. Bella is rarely found without a stick in her mouth, often trying to teach the Chickens how to play. In spite of her best efforts they just don't seem to get it! 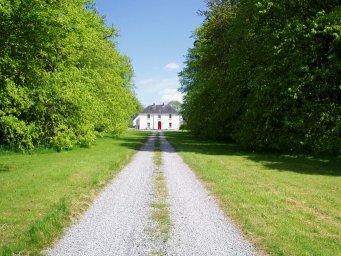 Croan House and Croan Cottages are accessed via a private avenue of mature Lime trees. The self catering cottages enjoy a wonderful setting on the grounds of the old house with views over the old walled garden and the wooded estate next door. We keep a number of animals at Croan Cottages, some to work, some as pets and many are of rare varieties. 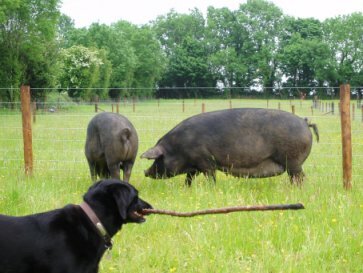 At the moment we keep Large Black Pigs, Geese, Goats, Isle d'France sheep, Guinea Fowl, a variety of Hen species, Ducks and of course Bella our Black Lab. The animals live in fenced paddocks just off the avenue although the Geese are encouraged to help themselves to the grass on the avenue - that means there's less for us to cut! 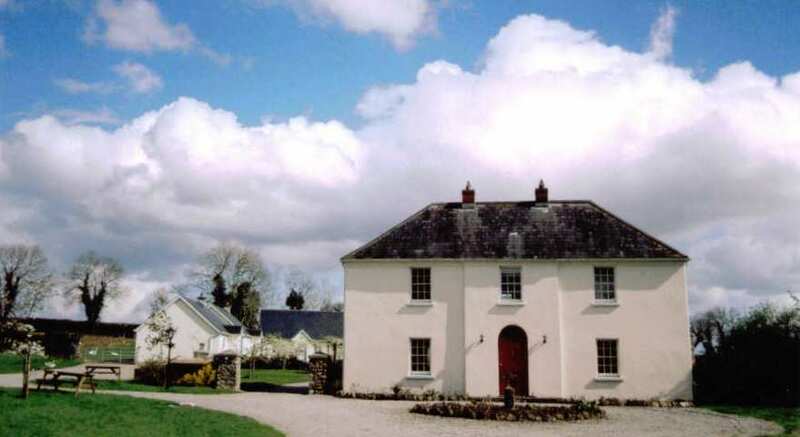 Be sure to return to the Croan Cottages website for updates on new animal arrivals and our work restoring the old walled garden of Croan House.